This post was written pre-transplant, hence the verboseness. It all still holds true. A co-worker of mine, Greg Hallerman, is running the Boston Marathon this year like he has for the past 8 years. He has run for both the Liver Foundation and Donate Life. This year, he asked if it was ok if he ran in honor of Logan and me. We told him of course, we would be very honored! You can follow along and track his progress by texting his bib number, 9488, to 345678 (see here for details). I asked whether there was a donation page for the Donate Life team, and there is not. Instead of donating money, consider registering to donate your organs, tissues, and eyes! 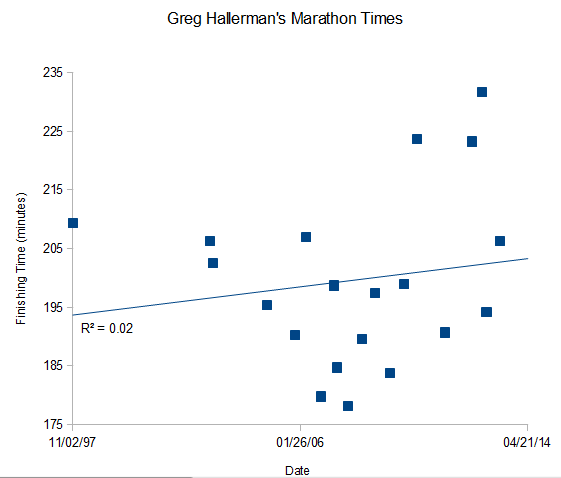 For a little information and maybe motivation for him, I plotted out Greg’s historical marathon times. There’s an upwards trend, which makes sense because it’s expected that runners slow down as they get older as evidenced by the qualifying times for the Boston marathon. There’s also not very good linear trend correlation (R2 = 0.02). So what should we expect his finishing time to be? It would be a statistically significant result if his finishing time was under 2:39:59 or over 4:07:06. More likely, I think it’ll be between 3:08:00 and 3:37:00. As someone who likes math, it’d be pretty cool to be at 3:14:15 (pi). And I told Greg that I would do my best to try walking 0.262 miles on Marathon Monday, one week after my surgery. Wow. Impressive commitment to running and an impressive chart. Best wishes for a tail-wind on Monday to Greg! Wow. 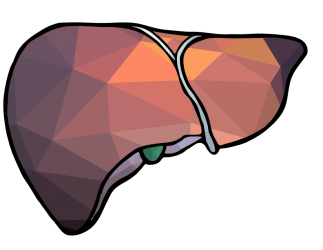 Great to see the stats and the special connection to the Liver Foundation. Best wishes to Greg on Monday! Very impressive data mining my friend. I am beginning to think this is an engineering blog 😉 I will try my best to run Pi (3.14.15) this year, if not I will eat Pie instead. Good luck on Monday Greg!! What an honor for you both ! Greg, you should only agree to eat pie if Derek gets well enough to make his Perfect apple pie with that nice flaky crust. Glad you two are on the mend Derek and Logan! 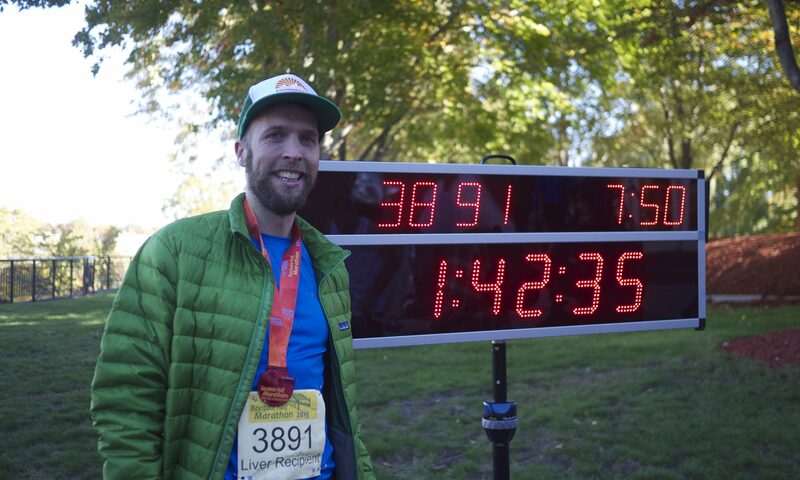 Derek, I just looked at Greg’s projected finish time… 3:13:02… average of 8.17 mph through first 25K. you may be right!